As one of the most decorated Edinboro women’s basketball players in program history, Laurel Lindsay was named the 2015 Fighting Scots Nancy Acker Senior Female Athlete of the Year Saturday night at McComb Fieldhouse during the 34th annual Edinboro University Athletic Hall of Fame Banquet. Lindsay concluded her career as the first Scot and third women’s basketball player in PSAC history to reach the 1,000 points, 500 rebounds, 500 assists club with 1,165 points (23rd on Edinboro’s scoring list), 533 rebounds (19th), 539 assists (2nd) while finishing with a record of 95-25 (.792) in a school record 120 career games played. “I hope that all my teammates just thought I was a good teammate and was always there for them and a kind person,” Lindsay said. “It’s not necessarily about being a fierce competitor or anything like that, it’s just that I hope they look at me with a positive light." 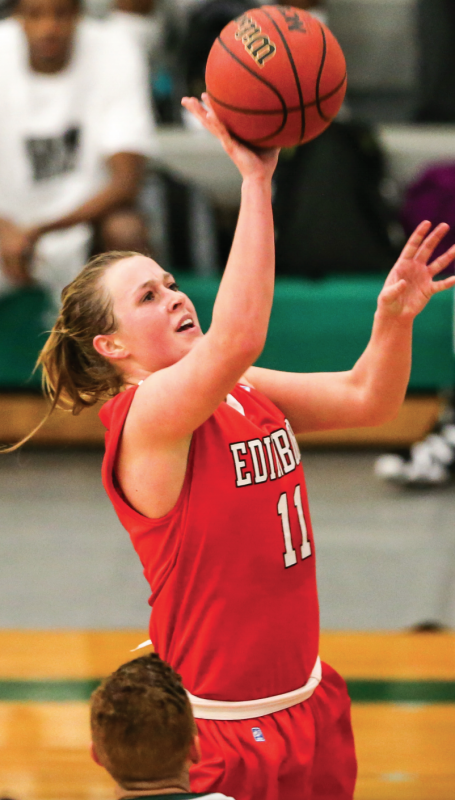 Prior to beginning what would turn out to be a memorable journey on the hardwood, Lindsay recalled feeling at home when visiting and ultimately selecting to Edinboro and head coach Stan Swank. “When I visited, I just felt so comfortable here and it just seemed like a place that I’d be willing to spend four years, five years,” Lindsay said. “I just really like his coaching style and the person that he is. The players at the time were so welcoming.” Following her first season at Edinboro, Lindsay suffered a knee injury that sidelined her for the 2011-12 campaign. Although Lindsay could not take the floor, she credited assistant athletic trainer Audra Neumann for helping her bounce back to be even stronger after the injury. Having already graduated in last spring with a bachelor’s degree in nursing, Lindsay had a difficult decision to make between moving on or returning for one more season, having one more year of eligibility left. “I went back and forth so many times during the season about what I was going to do,” Lindsay admitted. “I don’t really know if it was a single thing that made me decide to come back, it was more or less like I really think I missed it and wasn’t ready to be done yet.” Posting just the fifth triple-double in Edinboro women’s basketball history, Lindsay would carve out a 15 point, 11 assist, 11 rebound effort on Dec. 17 of this past season in a win over Millersville. Additionally, her efforts came in what would mark Swank’s 500th career win with the Fighting Scots. “He told me it looked like I was trying to steal his shine, like that was his big night,” Lindsay said. “It wasn’t until I came off the court that they told me. I honestly had no clue I was getting that many. That was a really exciting night, especially for coach Swank because that’s an amazing accomplishment.” During Lindsay’s time playing for the Fighting Scots, the undisputed big game was whenever Gannon got together with Edinboro, according to the graduate guard. Lindsay finished her career with an 8-2 record against the Lady Knights, including giving Gannon their only four losses of the entire year in the 2013-14 season. Following a Jan. 10 76-70 loss at the Hammermill Center, Edinboro got revenge in Lindsay’s final matchup with the Lady Knights as the Scots took a heart stopping 55-54 overtime win at McComb Fieldhouse. This past season, Edinboro finished 20-8 with a conference tournament quarterfinal loss, 71-63, at Indiana (Pa.). Lindsay finished the season fourth on the team in scoring (12.6 PPG), second in rebounding (5.4 RPG) and led the team while finishing 3rd in Division-II in assists (7.4 APG). Mike Fenner is a staff writer and the general manager for WFSE Radio.